As much as we would like to believe in ourselves, our actions, and our future there are times when that is really difficult to do. We can be filled with self-doubt, feeling like we have squandered our opportunities, or that we have made so many mistakes it is hard for us to keep moving forward. I know I have a great life and most of the time I am very much at peace with who and where I am. 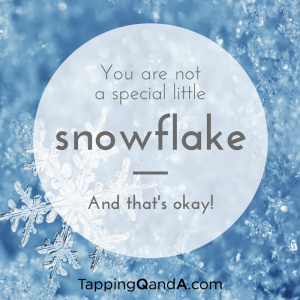 But there are times when I doubt…when I really don’t feel like that special snowflake I was told I would be. Here is one of those moments caught on tape. This is me tapping for not feeling like I am at all special. I encourage you to tap along with me. Powerful and very effective. Thanks! First, as soon as you acknowledged the presence of the “Little Snowflake” part of you (me) (us) I felt myself relax into Love. I think what happens is like John Welwood teaches, being present to some separated part is in itself the Love that is being looked for. So, amazingly or maybe a better word would be, naturally, your acknowledgement of this part, flooded me with love and relaxation. So courageous (of the heart) and right on for me today. I have been running a berating monologue under my breath that begins “Why haven’t you….? Why aren’t you….” So thank you. but there is still something real and rich that is hidden in there. I am not sure what it is yet, but please don’t shove that part of you aside as being “inauthentic”. I know you are authentic every single moment. Every breath. Me too. It is just that we have been taught that some parts of us are unworthy. What if we acknowledge we are authentically ambitious?Or whatever that voice wants to give us? What if we genuinely loved that part? Wouldn’t it reveal its true gifts now that it has our attention and a place in our hearts? I don’t know for sure. But I think so. Maybe that part has had to come in the back door because we wouldn’t let it in the front due to our training/beliefs/etc.So it has had to be really exaggerated and cause pain for us to notice? What if we don’t try to tap it away as being unacceptable, but open the door wider and see what it really wants to bring us once it is “home” in our hearts? This may not resonate with you at all, and that is fine. I guess I just needed to present these new thoughts that were so stirred by your tapping today.